I have spent the last 8 hours trying to figure out what was going on with my computer. It appears it was Version 11 not being able to properly update to version 12. After the auto update to Ver 12 this evening my computer apparently started hanging trying to complete the update process. I did not notice what was initially causing the issue and thought it was a driver hang or some other issue until after multiple system restores and safe mode checks I noticed that EIS was in a continuous loop to restart in order to finish the ver 12 update. Each time I allowed the EIS restart the system would again hang at the windows starting welcome screen. I came here and saw several mentions of ver 12 issues and attempts roll back to ver 11. I didn't see a ready link to ver 11, although I prob still had an old copy I didn't want to retry the auto updater. After going into Safe Mode and applying a restore point I was able to uninstall EIS 11 completely and then the computer restarted clean and had no issues. I then downloaded a new complete copy of ver 12 from the site and that installed cleanly and I appear to be back up completely. One extra issue during ver 12 clean install. The program may error right as the FINISH prompt displays. At the same time you will get the separate prompt that EIS needs to restart your PC to complete the install. You can OK the error message and then just allow the auto restart or close the prompt and do one manually. So I recommend if anyone gets the first issue with Auto Update to ver 12, get back to a clean Win7 start and delete ver 11 and start a fresh ver 12 install. What is interesting is that it's the complete opposite of my problem. I am installing EIS 12 on a relatively clean machine which has never seen EIS 11 nor any other security application and I am getting issues. This is now Day 6 since I have reported this and I am getting tired of the whole thing. I am glad that you're sorted as not only you're up and running but there's perhaps light at the end of the tunnel for the rest of us. Well I spoke too soon. Next restart same issue, hang at Welcome Load Screen. But one more piece to this apparent puzzle. I decided to take a look in Programs folders after even the uninstall of Ver 12 hung. I had two installs. One in Programs and one in programs(x86). Couldn't tell which was which ver so i manually deleted everything from folders and registry. And here's the other note, I had ver 11 on my laptop sitting next to my PC on and older license and it upgraded ver 12 no issues. And it only has one install and it is in Programs only. I also checked my licenses and it had used two of my 3 brand new licenses on this same PC machine. They better not be burning a new license to give us the ver 12 upgrade. I was saving that to extend my laptop in the next 90 days. I'll also have to check my grandkids box tomorrow that I installed ver 11 on with the 2nd of the three licenses I just bought. I am as clean as I can get and I'm going to try a restart and if that is clean I'll try a clean ver12 again. I'll post back my results. And that was a bust. I let that Welcome load screen sit overnight and whatever EIS wants WIn7 to do it isn't happening. As soon as I uninstall ver 12 through programs and settings I can restart at will with no issues. 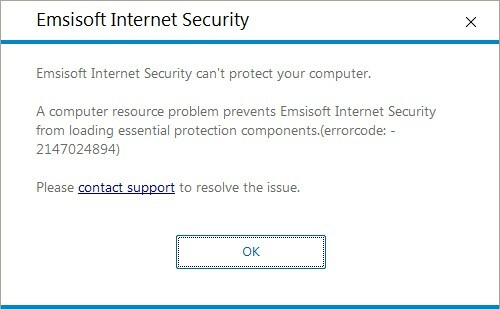 I hope EMSISOFT gets a handle on this problem, or I have two licenses I'll be asking for a refund on. And now GREAT. I went in to the License center and the 3-pack I just bought aren't in there. Just GREAT EMSISOFT. Would it be possible to get access to your system via remote desktop solutions like TeamViewer to further debug the problem? Then the license key was never registered on this Emsisoft user account. Don't worry about his. This can be done later. Lets try first to solve the technical issue. please take a look in your PM box. Sorry, but I'm not going to allow any access to my computer in that fashion. If you wish to continue to help, please see my additional information in this post as I moved to there. After a 3rd uninstall and re-installation I was able to get the program operating. I was able to go into all initial settings and customized my preferences. I did not attempt a scan at that time. I closed the GUI and proceeded to use the PC normally. I then shut-down restarted and upon restart the same WIN7 welcome screen loading hang with constant swirl. Win7 good load but now immediate EIS program errors until final Major Error and EIS unloads itself from the Win7 Icon Notification area. Previous install errors screen shots at that other thread. If you want to continue here I will move them in. EIS is currently shown in Services as Automatic start but not started. If start service is attempted immediate error is thrown. Exactly the same problem. Stuck after the welcome window. Installing Windows 6.1-KB2921916-x64 does not help. Temporarily solved the problem installing a version 11 "deferred" channel updates. When waiting for patches 12 version for windows 7? Several files coming to you in PM for examination. I'll load some Avira Free for now and sit behind my hardware firewall. After working with Christian I have a good install. The Windows Startup hang is a known issue now and a Beta update solves that problem. The final Ver 12 clean install was able to remain stable as long as it didn't require a restart for initial patch or updates. Christian move me to Beta update before they had the new stable posted. Just to be perfect I uninstalled all my updated versions and started over with the new final 6859 from the front page.